To quickly sum up my previous post... I reacted to Rabbi Nathan Lopes Cardozo's idea that the "greatest accomplishments for mankind" are achieved by knowing how to take risks, and that the current Orthodox leadership seems to be completely risk-averse. I countered that even if such risks were taken in Orthodoxy, it still wouldn't constitute a "great accomplishment for mankind," and that those accomplishments (by Jews and otherwise) are primarily achieved in the secular arena. Whereas with Avraham Avinu, "Judaism" itself was the contribution to humanity, by and large since then the great contributions by Jews have had little if anything directly to do with "Judaism." The discussion got me wondering: Does Judaism itself have any "big things" left to contribute to humanity? The frum answer is "Of course it does." Because "Judaism is right," and eventually (when Mashiach comes) everyone will come around to that fact. The nations of the world will acknowledge that the Torah is Truth, that Hashem is the One and True God, and that the Jewish people are the representatives of that Truth in the world. My sense is that Reform, Reconstructionist and Humanistic Jews would also say "Of course it does." Only they'd speak about it as "Tikkun Olam," that the Torah instructs us to enact justice in the world, feed the hungry, fight for the oppressed and live in peace. As I said in the comment section of the previous post, I do not for a minute minimize these goals or see them as "non-religious." However, I do tend to think that rather than humanitarianism being something which emerges spontaneously from people immersed in Torah study, it's more that sources in Torah are used as a chizuk (reinforcement) to justify the humanitarian values people already believe in. Judaism is in essence used as an asmachta (support), which I think is a perfectly appropriate and idealistic thing to do. But I don't know if I'd say that it's "Judaism" per se which is making the contribution. Humanitarianism is something which is fairly universal - albeit sorely lacking universally! It also got me thinking about what I'm doing with this blog. What do I think the idea of "Atheodoxy" has to contribute? Is my orientation purely about internal Jewish affairs - as in creating a space for people who love Torah/observant life but can't (or won't) "make themselves" believe in myths? Is it about my vision of an "ideal Judaism" which has all the benefits of observance and none of the sacrifice of reason, which prides itself on intellectual honesty and lack of dogma? I think it is. But am I also after something more? Am I also playing with the idea that a God-free Orthodox Judaism might have something to contribute to the world? Well if so, it's not about the "no-God" idea per se, which already has plenty of evangelists. In other words, it's way too late for anyone to try to be the "Avraham Avinu of atheism." But maybe it's this... To try to pull the rug out from under religious fundamentalism. As long as we speak about any actions we do (or don't do) in the world as being commanded or desired by God, we leave the door open for fundamentalism: My God vs. your God. 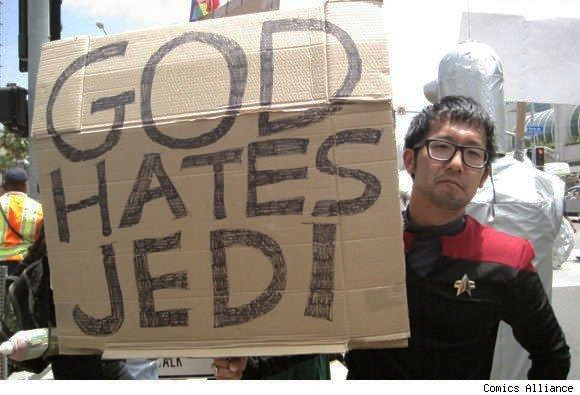 God hates X, so therefore we hate X. Living for God, dying for god, killing for God, etc. - it all rests on the idea of using God as the absolute, transcendent justification for what we do and what we believe in. What I'm saying is that while it may feel good, and while it may even "work" to a limited extent, the end result is absolutely toxic, and it's time we kick the habit once and for all. Ok, so why not just become secular, or join a different denomination? First off, because I think traditional Torah/Judaism has a great deal to offer - communally, intellectually, in terms of personal growth, in terms of Jewish survival, etc. But the second reason is strategic - it's an altogether different way of tackling the problem of fundamentalism. It's one thing to reject the nonsense, reject the fundamentalism - and then reduce one's religious observance or jettison it altogether. But it's another to transform a religion from the inside, to maintain one's commitment to religious observance, while simultaneously ridding that religion of fundamentalism. A Reform Jew who rejects fundamentalism? (Yawn) Par for the course... An ultra-liberal Muslim who rejects fundamentalism? Great, but not particularly exciting... But an Orthodox Jew or a traditional Muslim who completely and utterly disavows fundamentalism by removing any Divine justification for their religious practice? Now that's a statement! That's what I think I'm after here. To have a rejection of fundamentalism come from the most "religious" (i.e., traditionally observant) members of a given religion would in my opinion constitute a great contribution to humanity! And so an Orthodox Judaism which led the way for other religions by having the courage to reject the unhealthy parts of itself, to renounce fundamentalism entirely, and yet show that it can still remain a robust and positive religion with a great deal to offer - culturally, morally, intellectually, spiritually - would constitute no less than a revolution, one that would definitely stand as one of the "greatest accomplishments for mankind" (to use R. Cardozo's phraseology). Well, that's the idea at any rate. I recognize it's a near-impossible task, even within Judaism. And I also recognize it's not a panacea for the world's woes - I know there's plenty of killing and human-driven misery that has nothing whatsoever to do with God. But you've got to start somewhere - and as good a place as any to start is right here at home, by doing some deep introspection about the way we conceptualize Judaism and what that contributes to the world. After all, if ultimately we have to say, "Because God told us so," what's to stop anyone else from saying the same thing? you should pick up Betraying Spinoza by Rebecca Goldstein. You should know more about him, and she is a very clear writer on his philosophy. An interesting and eye-opening read. What percentage of your community feels like you inside? I couldn't even guess at percentages. In any case you have to define "community" and "feels like me". If by the latter you mean not believing in myths, miracles, Torah min hashamayim, etc., my sense is there are many more out there than you think, just that you wouldn't know because they keep quiet. If you mean being on an anti-fundamentalism crusade, probably very few. In terms of community, my guess is that the more you move toward left-wing Modern Orthodoxy, the larger the percentage you'd find thinking similar thoughts to mine. On the other hand, the further right you go, the "crazier" the rhetoric tends to get, so you can be sure there are plenty of people in very frum circles who just don't buy it. Thanks for the book tip! Judaism: Incubator for *Secular* Greatness? How do you relate to Tisha B'Av? Do You Believe in Extraterrestrial Abduction?